Last week we found out that the LG G6 would come in a jet black iPhone 7-like shade, but it seems the brushed metal design will make a comeback after all. New photos from Under KG show the LG G6 from a number of angles, with a silver brushed metal back. There’s a headphone jack on the top-right edge of the phone and a USB-C port on the bottom. 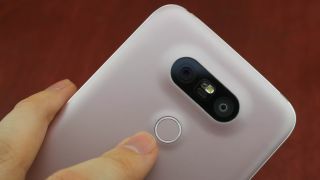 The back of the phone shows off the fingerprint sensor in the center – unlike on the Samsung Galaxy S8, where it looks to be awkwardly off to the side – and there’s also a dual-lens camera on the rear. Meanwhile, AndroidPure has some images of the LG G6 in a case that further hammers home the brushed metal design. It looks like LG will be pushing this phone as the main variant. Other rumors for the LG G6 suggest the phone will have a 5.7-inch 1440 x 2560 resolution display, a Qualcomm Snapdragon 821 processor and Android 7 Nougat software on board. Leaks and rumors of the LG G6 will likely continue to keep pouring in until we see the official announcement of the phone at MWC 2017.